December 1, 2017 | Kevin M. Mazza, Esq. In the third and final blog post of this series, I will conclude my summary and discussion of the current 2017 Family Part Rule Amendments, including those of more general application. The cases of R.K.v.D.L., 434 N.J. Super. 113 (App. Div.2014) and Major v. Maguire, 224 N.J. 1(2016) highlighted the administrative and procedural problems in the filing and handling of non-dissolution family actions, particularly those which were complex in nature. In response to these cases, Rule 5:4-2(i) was previously amended not only providing for the filing of non-dissolution complaints utilizing forms promulgated by the Administrative Director of the Court, but permitting attorneys to file their own drafted “non-conforming” complaints, as long as those complaints also had appended thereto a completed supplemental form promulgated by the Administrative Director of the Courts. In this cycle, Rule 1:5-6(c)(1)(C) was amended to make clear that in the event non-dissolution complaints were not filed on and/or with the appropriate forms as promulgated, same would be returned stamped “received but not filed (date)” with notice that if conforming papers were filed within a designated time frame, filing would be deemed to have been made on the stamped receipt date. Rule 1:11-2 governing the Withdrawal or Substitution of Counsel was amended to add a new subsection (c) providing that where an attorney is seeking to appear representing a client who had previously appeared pro se, the attorney must file a Notice of Appearance, and not a Substitution of Attorney, and pay the appropriate Notice of Appearance fee. It should be noted that counties are also requiring new attorneys to file a Notice of Appearance in post-judgment family actions if they had not previously appeared as attorney of record in the matter. In a previous blog post, I had discussed something known as “Metadata”, which has been defined as embedded information in electronic or digital documents that is generally hidden from view in a printed copy of the document, generated when documents are created or revised on the computer, reflecting such information as the author of the document, the date or dates on which that document was revised, tracked revisions to the document, as well as comments inserted in its margins along with information necessary to access, understand, search and display the contents of documents created in a spreadsheet, database or similar applications. Simply stated, whenever an editable document is created, whether utilizing word processing software ,spreadsheet software, data entry software and the like, the entire “history” of that document maybe embedded with it. In 2016, the Court Rules were amended in numerous respects to highlight to the bench and bar the existence of such “metadata”, and to start addressing the handling of same, including from a discovery and ethical perspective. Given the advent of the electronic filing of documents with the court, the Supreme Court in it’s recent Rule Amendments sought to address concerns over the handling of “metadata” in such an electronic filings. As such, Rule 1:32-2A was amended to add a new subparagraph (d) making clear that it was a responsibility of filers to remove any metadata in documents that they do not want to become part of the public record before submitting such documents for electronic filing, noting that such metadata may possibly include personal identifiers which are required to be removed under Rule 1:38-7 in any event. This Rule further provides that in the event a party wishes to remove metadata from a document after it has already been filed, a motion must be filed to either remove the metadata or to replace that document with a version that does not contain the metadata. While the courts have not yet implemented electronic filing of family dissolution matters, it is likely only a matter of time. 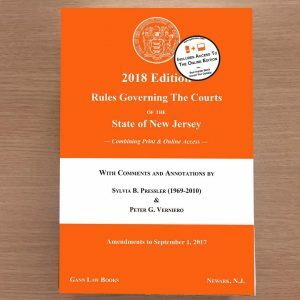 Rule 1:38-3(d) was amended to designate additional documents, including notices required by Rule 5:5-10 such as requisite financial, custody and parenting plans, settlement agreements incorporated it into judgments or orders in dissolution and non dissolution actions, as well as parenting time and visitation plans pursuant to Rule 5:8-5 as amongst those court records excluded from public access in Family Part proceedings. Rule 1:40-4 was amended to address collection procedures for fees owed to mediators, and specifically providing that the remedy for a family mediator to compel payment is either by an application, motion or order to show cause in the Family Part or by a separate collection action in the Special Civil Part or in the Civil Part if the amount owed exceeded the jurisdictional limit of the Special Civil Part. Rule 5:7-1, the venue rule, was amended to address matters involving the termination of a domestic partnership and/or for the dissolution of a civil union in which both parties were now non-residents and were without a forum that’s available to dissolve same. In these cases, venue shall either be laid in the county in which the Certificate of Domestic Partnership was filed or in the county in which the civil union was solemnized. Rule 5:7A dealing with the handling of Domestic Violence Matters was amended to confirm that a domestic violence hearing officer was also a person authorized to take testimony in connection with an application for a temporary restraining order. Finally Rule 5:8-5, dealing with custody matters, was amended to provide that where mediation is conducted under Rule 1:40-5 (a), Custody and Parenting Time/Visitation Plans are to be filed no later than 14 days following an unsuccessful mediation. The Rule continues to require that such Custody and Parenting Time/Visitation Plans be filed no later than 75 days after the last responsive pleading is filed absent such mediation. It should also be noted that a minor revision to the Family Part Case Information Statement was made to include anticipated college/post-secondary educational expenses among the listing of “issues in dispute” on page 2 of the C.I.S. Further, Appendix IV-A, Considerations in the Use of Child Support Guidelines, was amended to include substantiated financial obligations for a disabled family member among those factors which may require an adjustment to a guidelines-based child support award.